The Hamilton Fighting Game Community began as most good things do, just a bunch of friends getting together to have a good time doing the things that they enjoy. As the group began to grow a points system known as ranked battles (Ranbats), was instigated so that a champion could be crowned at the end of each gathering (Though in Hamilton it is affectionately referred to as Hambats :). From those early beginnings, the Hamilton Fighting Game Community has evolved to have a membership of over 300 and host 15 Hambats for members per year at the Western Community Centre, this group is a registered organisation and its members participate in wider community events such as NerdFEST, Treats in the Park and the LetsPlay.Live World Tour. In April 2018 they take the biggest step yet, hosting Hamilton’s first-ever nationally recognised Fighting Game event at Sky City Casino Hamilton! 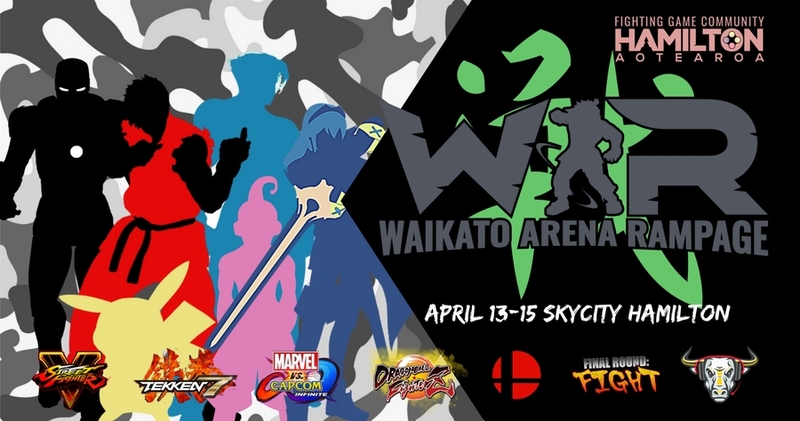 This event is made possible with the support of the Waikato United Gaming Society (WUGS for short), Final Round: Fight!, Standing Fierce, and Digital Native Academy. And that brings us to the Waikato Arena Rampage eSports Event! W.A.R will take place from 13 April 2018 to 15 April 2018 and will be held at Sky City Hamilton. Competitors from all over the country will descend on Hamilton city to battle it out to become the inaugural champion in one of the 6 competition games, Tekken 7, Street Fighter V, Dragon Ball FighterZ, Marvel V Capcom: Infinite, Super Smash Bros: 4 and Super Smash Bros: Melee. W.A.R is free for spectators and will provide free to play areas for spectators to try out some of the games on display. For entrants and competitors, we will have specially designated areas for them to showcase their skills and special activities that only they can participate in. For those unable to make the local event, W.A.R will be streamed live via the Standing Fierce Twitch Channel and we will have an audience area where spectators can watch some of the country’s best fight it out. The main prizes include flights and accommodation to represent the NZ Fighting Game Community at Australia’s biggest esports tournament, Battle Arena Melbourne. There will also be cash prizes up for grabs! Friday 13th April – Setups and social gaming! Fortnight antics and more fun multiplayer antics. Saturday 14th April – WUGS will be running 2 main tournaments: Overwatch and Rocket League! These two tournaments will be 1v1 and will not only be for cash prizes (a minimum of $50 for the winners, this number will go up with the number of attendees) but will also be for $50 PB Tech Gift Vouchers! Sunday 15th April – More social good times, the WUGS community plays all sorts of games at their social LANs such as (but not limited to), Blur, Garry’s Mod, AoE II, Quiplash, PUBG, Gang Beasts and Chivalry. There will also be fun mini-tournaments and competitions for LAN attendees and spectators to join in the fun.